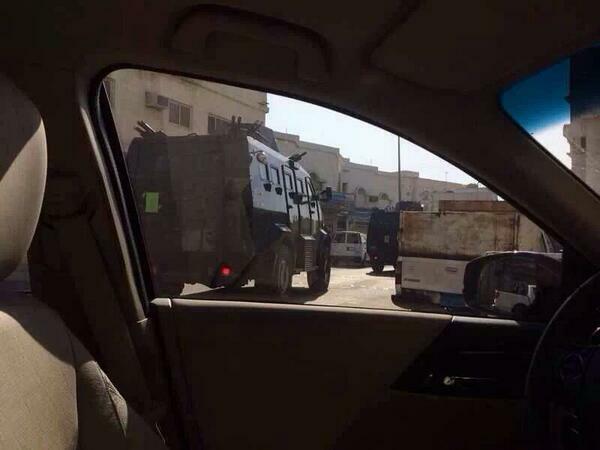 JNN 07 Apr 2015 Riyadh : Security forces raided houses and arrested several people in the Shiite-majority city of Awamiyah in Saudi Arabia’s Eastern Province, local sources said. Using military and armored vehicles, Saudi security forces carried out raids on the houses of civil activists in the city on Sunday night and took tens of people into custody. A police officer is reported to have died and several people wounded in the operation to crack down on dissent in the city. Awamiyah is the hometown of Shiite cleric Sheikh Nimr al-Nimr who has been arrested and sentenced to death by the Saudi regime. There have been numerous demonstrations in Saudi Arabia’s oil-rich Eastern Province Of Shia Majority area since 2011, with the protesters calling for political reform and an end to widespread discrimination. The recent operation in the Shia Majority area with full force also indicates the Mental state of the Saudi Monarchy as they are afraid of a Huge Revolution in the Offing with in the State , and as a result of it losing their Monarchy . And even the Air Strikes on Yemeni People also indicates the Disturb Psychological order of Saudia and Allied states , who have usurped the Legal rights of the Citizens of their respective countries , and the Royal families are enjoying all the Luxuries of Royal Life Style at the expense of the Common Citizens of their Country. As Per the reported State of Poverty only in the Saudi Arabia atleast 66% of the Population lives Under the Poverty Line , while in contrast to it . Dozens of Family Members of the Royalty are among the Richest People in the World . And this is Purely due to the Injustices Done by the Saudi and other GCC countries Royal families , who have minted Money from the Natural Resources of the Country , while have not shared the Income of these God Gifted Natural Resource with the common People of the country which is their Due Right , which has created a wide Divide between the Rich and Poor Population of these Countries. As part of the regime’s oppressive policies, the top cleric Sheikh Nimr was detained in July 2012 following demonstrations that erupted in the province. He was accused of delivering anti-regime speeches and defending political prisoners, and was later sentenced to death. His arrest sparked widespread protests in the Arab country and around all the Shiite Population areas around the world . This entry was posted in Middle East and tagged Awamiyah, Crack down, Eastern Province, Eastern Province Of Shia Majority, Saudi Arabia, saudi monarchy, saudi regime, Saudi security forces, security forces, Shia Majority, Shiite Majority. Bookmark the permalink.